I hope each of you are having a good weekend with your loved ones. Earlier today, I went to have afternoon tea with some friends at Taj Boston. It’s part of our tradition for the holidays, but all we could think about this time were those affected by the tragic events in Newtown, CT and Henan, China. Reading an interview with one of the Newtown teachers had us in tears – it showed how much our educators care about the kids, and how fragile life can be. On a much more trivial note, thank you for all the input on this last post. I read each one and noted down some favorite suggestions to try. To answer questions on why bother keeping the jacket – I personally love the vintage-inspired look (when paired right), and appreciate that it challenges me to experiment beyond my typical safe pencil skirts/dresses. It was also final sale, but I would’ve kept it either way. As some readers noted, more visual volume on the bottom helps balance out the boxy structure of the jacket. One easy way to do this is with long, lean, boot-cut or slightly wide-legged trousers that just skim the top of your heels. I stuck with a light color, but also liked reader suggestions of denim or navy pants in a similar cut. Looking at these photos, I realize that the torso looks a little short now compared to the leg line (making a mental note to un-tuck my blouse next time). I tried these BR Martin flannel trousers (love the wintery look with the wool jacket) in 00P, but unfortunately did not keep & alter due to the higher rise and visible pocket lining. Lastly, I’ve mentioned before how I’m often amazed and inspired by many readers of this blog. I wanted to share a photo of a reader all the way from Prague that made me smile. Bara is a small business owner and mother of two boys, who was invited to a talk show to teach other entrepreneurs about sushi. She said she was very nervous but wanted to come across like a confident business woman, and chose an outfit inspired by me and my blog. I was so honored to hear this, and think she looked fabulous! Hi Jean, looking great as usual! I've just purchased the Lo&Sons; O.G. bag for work. Have you heard of them? I would love for you to do a post on work bags and/or a review of their bags. theres just something about this jacket; im just not a fan. it's too boxy and looks dated. sorry. Hiii Jean, I was wondering if you had to detach the sleeves from the body when you slim the sleeves down. You did a fabulous job of matching the pants with challenging jacket. I contributed the idea of boot-cut pants/trouser, and glad to see you put them together with heels. The color matching is awesome, better than I can image. I love your sharing of thought process. Anon, I think everyone should have at least one hoity-toity politician's wife at a press conference jacket, haha. Jean, your legs go on for days in those pants! Also good eye on the slimming the sleeves, a small alteration (to you, I could never do it) but it made all the difference on how the jacket looks on you. I am wondering how the outfit would look with your blouse untucked? 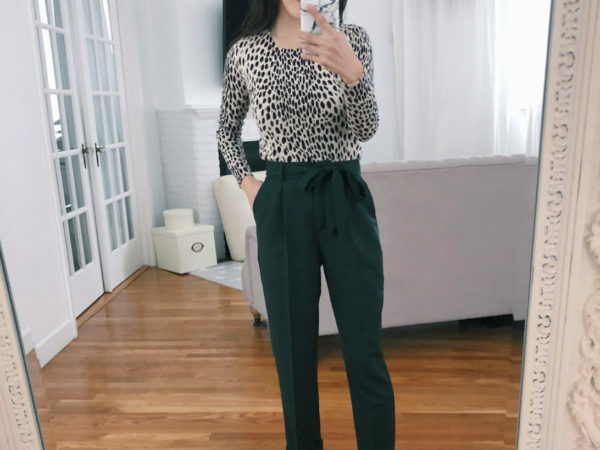 You mentioned your torso looked a bit short but initially when I saw the pictures and before reading your thoughts, I imagined a tucked silk blouse would elongate your legs even more! I am wondering if it's the sharp lines and boxy shape of the jacket that appears to shorten your torso. Bara looks stunning on the tv show, very chic and professional! Nicely paired Bara! The jacket looks much better with the sleeves taken in. The pants look amazing on you. Your legs look so long! What an honor having my picture published on this blog. Thank you Jean, for everything. I got so many compliments about my outfit and that just wouldn´t happen if I wasn´t following this blog. Before I was always at lost in shops and didn´t know what to wear to look profesional, but styl stylish. you look so nice, and it's very sweet of you to share Bara's pic. this is a cute touch on the blazer…the animal print detail from the shoes give a more elegant touch on your outfit! Also, how sweet of you to share Bara's story. It's good to know that there are still popular bloggers that are humble and appreciative of their followers! I love it! Amazing how much of a difference the wide-legged trousers make. I think it would look better with same style/color pants that did not have a visible closure and belt loops. the uniqueen jacket fits that bill of a modern "vintage" look. in fact, i liked it too when jean reviewed it and picked one up for myself. while the uniqueen is more expensive, i can justify that purchase because it easily pairs with jeans, leggings, skirts.. IMO this jcrew jacket is not versatile enough to be a part of a streamlined closet. closet space is invaluable in my neck of the woods! I give up! You always work it out. This is perfect. Pairing the jacket with a colour in the bottom that matches the pockets rather than the rest of the jacket is genius. It ties it all together very nicely. Love how Bara looks. Her outfit is definitely inspired by your blog, but so very much her own. She just looks natural – her look does not make me feel the need to scrutinise how she put it together because she just looks confident and comfortable in what she is wearing – truly inspirational 🙂 Wish you much success Bara! I was wondering how the Chinatown tailor work out? I remember that you mentioned him in your post at some point. It definitely works with the trousers! So glad you shared Bara's pic with us! She looks so confident and all business 🙂 I dont see nerves at all! The outfit is inspired it is still so her! You looked prefect! Funny, when I saw the picture I though "That's so Jean!". I can tell you I've used that exact look for many networking functions, it's a go to one for me. Thank you – I had a neighboring suburb on my mind. I think he's a good tailor but haven't gotten enough done to confidently recommend him. I brought two pieces to be worked on – 1) lined pencil skirt to be taken in at the waist and hips; and 2) unlined trench coat to be shortened. The two were $30 together (probably 40% cheaper than the tailor I usually go to). Pencil skirt came out great, but the jacket hem had slight tension issues with the thread. I admit it was tougher to work on because the trench hem is curved (otherwise I would've just done it myself!). He's located on Knapp st in an unmarked building with large window, through which you can see an older man with his sewing table. It's tricky, because Knapp bends at a sharp angle. If you look on Google maps, his temporary shop is across from what is labeled "coco head hair studio" on the map. Great look that you chose with the wide leg trousers to pair with the blazer! That's such a sweet note to get from one of your readers! You're business attires are very inspirational. Love the pants! You looked great! I feel inspired to see Jean has inspired others with her fashion sense. I am inspired to inspire. lol. Love back from San Jose! Janki: I kind of splurged on the jacket little bit, I don´t usually pay that much for clothes (it was about $500), but I know I love this style and think it is so versatile. So I also hope to wear this for many different occasions. Amadea: Jean inspires so many ladies all around the world, it feels nice to share passion for her style with you! I actually really love the jacket on you! Last post, I was a bit unsure. There is something about the upscale preppy look this jacket gives that is just so unique! Love the addition of the pearls, makes it less stuffy, oddly enough. FABULOUS! Maybe you'd like to follow each other via BLOGLOVIN? Such a cute look! Loving that lady coat paired with the trousers! JCrew.com marked down more items this morning. The lady jacket is $79.99 and the lady coat in pink is $139.99, plus an additional 30% off everything. Glad you are keeping the jacket and experimenting. Love it with a wide leg trouser. How nice of the reader to send you those images. She looked great!!! By the way, those visible pocket linings can be cut out and the pockets sewn shut… since I'm not technically extra petite (I'm 5'2" but curvy) I tend to sew pockets shut and eliminate pocket linings as a matter of course, to make my hip line look sleeker. Hi to every body, it's my first pay a visit of this blog; this website carries amazing and really good material for visitors. Excellent post. This jacket is amazing and you look so beautiful. I like this jacket very much. The color matching so nice. Thanks to sharing the useful information about ladies jacket.